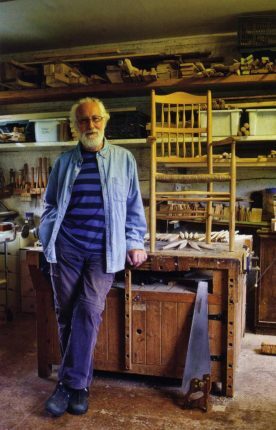 Paul Spriggs was a consummate craftsman who gave up his first career as an architect in 1980 to make rush-seated chairs and furniture. In 1980 he joined the Gloucestershire Guild of Craftsmen. He was a valued and highly regarded member, exhibiting regularly and always ready to take part in any donkey work involved as well as to support up-and-coming members with advice and encouragement. Originally inspired by the Arts and Crafts ladderback chairs designed by Ernest Gimson, he looked to develop timeless designs that were both functional and looked good. He was always modest about his achievements, setting very high standards for his own work. He made the chair here for an exhibition he organised for the Guild as part of the Broadway Arts Festival in 2014. Examples of his work on public display include the font cover in the church at Daglingworth and the altar cross in St Matthew’s Church at Cheltenham. There is a film of him at work in The Wilson, Cheltenham. He died on 21 April 2017 and will be much missed.